It’s year-36 for 4H Wagon Train and my second year as a Teamster on this adventure. Last year’s 70+ mile Trek on the Barlow Road in the Mount Hood National Forest was a life-changer for me. It might not seem possible, but my passion for 4H Wagon Train has grown in the months since my last post. Everything seems to be related to Wagon Train – what I read, gear I buy, horse-activities – most of my casual conversations seem to unintentionally funnel into a discussion of Wagon Train. My affection for my Wagon Train family also grew during the months since we concluded our 7-day journey together last July. I’ve reunited on various occasions with new friends from Wagon Train and deepened my connection to Teamsters and other leaders who mentored me through my first year. I’ve also come to know more about the amazing family of devoted volunteers who quietly and humbly put heart and soul into making the 4H Wagon Train adventure happen – with over three decades of experience and a solid record of success, their work is truly a wonderment. I hope to repeat the success of my year-one experience, as it needs no improvement, but there will be one change – I’ll have a new Swamper this year, Grace Clark. Grace is a 14 year old, 8th-grader with a great passion for horses and learning and improving herself as a horsewoman. Last year, Grace approached me on day-one hour-one of Wagon Train Tune-Up to offer help with my team of horses. That day she picked-out hooves, and by the last day of Wagon Train Grace was harnessing and driving as well as any pioneer. Jeff Clark, Grace’s dad, told me that whenever he was looking for Grace during Wagon Train he knew he could find her hanging around the teamsters looking for horse(and mule)-related jobs. (If you read last year’s “Wagon Train Connectivity” post about two teenage brothers on the very first 4H Wagon Train, this behavior might sound familiar). Grace might be making an appearance in this blog with her views of her first 4H Wagon Train experience. For me, Grace has given even greater meaning to Wagon Train in year-two. Since the end of Wagon Train last year, Grace has taken every opportunity to drive, plow and log with horses and mules, and gained impressive skills and confidence. Grace turned her new learning experience into a school project and she made the local news. She has many qualities that I appreciate, but her calm, quiet, self-assuredness around horses and mules is what I believe will make her a great Swamper and someday a great Teamster. I am happy and proud that Grace will sit beside me on the seat of the wagon as my Swamper for every mile of the 2018 4H Wagon Train as my Swamper. Swamper is an 1850’s slang term for “assistant” which meant someone who worked with loggers to clear roads through a swamp. The moniker transferred into many industries to mean someone who does odd jobs and keeps things running smoothly. On a wagon train, the Teamster and the Swamper work together for the care and maintenance of the team, equipment and wagon, and if the Teamster is disabled the Swamper takes over. The Swamper plays a vital role in wagon operations – she is the sidekick and navigator, she is an extra pair of eyes and hands and an extra brain to calculate safety and avert crisis. On a steep trail, the Swamper is the invaluable brakeman – she uses all of her strength to lever the handle of the brake as tight as possible against the rear wheels to prevent the wagon from pushing the team down hill or running them down. I am already counting the days until Tune-Up weekend in June when we make sure the team, wagon and equipment are trail-ready for the big week-long Trek in July. Grace and I will also get to practice as a two-woman crew taking care of two 1,800 lb. horses, a 2,000 lb. wagon and all the necessary gear. I’m also gearing up to continue this blog writing project – last year I wrote a dozen installments to this blog telling the story of getting ready for my first wagon train and the history of this uniquely American experience. If you’re interested, you can go back to my 2017 posts to this blog to get the story of year-one. This year, I hope to share more about the people of wagon train, past and present. My next post will be about human perseverance and includes the remarkable story of the great grandmother of one of our very own 20-year 4H Wagon Train veterans. If you are considering participating in 4H Wagon Train, the Tune-Up weekend is a wonderful way to get yourself ready and see what it’s all about – this year it will be at the beautiful 4H Center outside of Salem June 9-10, 2018, outriders and walkers are welcome (*limited availability)! Participants are required to attend at least one of the three 4H Wagon Train orientation meetings – more info at www.4HWagonTrain.org. The first 2018 4H Wagon Train orientation meeting is only 3-weeks away, on March 17th! It’s the best meeting of all because the excitement has been building all Winter. We will meet new folks who want to hear about our favorite summer pasttime, and the best “summer camp” ever invented, and we will reunite with members of our existing wagon train family for the kick-off. Hope to see ya’ll there! I’ve only been indoors the last 3 of the past 10 nights. Tonight, the weather is cool and dry, like the nights spent in the past week with 4H Wagon Train, in the Mt. Hood National Forest. I considered hanging my wagon train hammock in the trees on my property and going back to sleeping outdoors as often as I could manage it. I seriously considered it. Indoor sleeping feels so closed-in now, even with all of the windows open wide. I learned a lot about myself in the past week on my wagon train adventure – like I love sleeping outdoors, and the comfort of sleep with forest sounds and smells around me and the treetops and clear night sky full of stars above me. Even on the nights when I slept close to my horses who were highlined in the trees, making their noises of shuffling and snuffling and munching on their hay, I was comforted by the open air. Even if you are someone who goes tent-camping on a regular basis, this wagon train thing is different. It’s hard to explain, it’s not just better sleep – many new things opened-up for me when I was almost entirely without walls for a week. The most surprising thing for me about my wagon train experience is how emotional I was. I felt so connected to all of these total strangers who, like me, came to the trip carrying their individual flags of self-sufficiency, and ended the trip still not knowing much about each other but bonded under the wagon train banner. Tightly. And I’m not the bonding type. Nor am I much for “Group Life” – at least I didn’t think I was. I am a highly functioning introvert with a wide independent streak who, I think I might’ve mentioned in a previous blog, loves her personal space. But there was no personal space on this trip, it all belonged to the group, and I sort of adopted that concept after a day or so (or, it adopted me). We ate and slept together, worked and played together, walked and rode together, and I didn’t feel like I needed to get away from the group (except for obvious reasons). Summer and camp was not much of a part of my childhood, but from what little I remember it was kind of miserable. I easily let go of all of those “once in a lifetime” experiences, and have no memory of regular summer activities except being shuttled between my divorced and emotionally-broken parents. It wasn’t a childhood filled with cookouts and campfires and sticky s’mores and sing-a-longs. I came out of all of that just fine, really! Except I didn’t know the words to any of these camp songs that everyone seems to know, and I’d never sung out-loud except alone in my car with the radio very loud so I can’t hear my own untalented voice. But this wagon train thing is different…as the song goes, “we’re in this together…” and I discovered that when the heart is truly open and happy, you gotta sing! I heard my own voice for the first time, I sang silly camp songs, and I wasn’t self-conscious in this group of mostly equally bad singers. Now I can’t get those tunes out of my head! Which brings me to The Wagon Train Kids. When I started mentally preparing for wagon train, my greatest anxiety was I would be interacting with kids. I don’t have kids, never wanted kids, and couldn’t say I related to kids. I’ve only known a few kids who could relate to my sarcasm, directness and dogmatism, with a side-order of silly. As I get older, this problem gets worse – kids don’t seem too relate anymore unless it’s through their electronic devices. So I expected to be really uncomfortable and feel, as I always do around kids, like an outsider. But this wagon train thing is different. Every. Single. Kid. On. This. Trip. Was. Exceptional. I had actual conversations with each of them, I felt like I was magically speaking a foreign language and we understood each other. I wondered to myself what it would be like to know each of them as adults, to watch them become who they will each become. I looked at their dirty, smiling faces every day and wished for them to never have to grow up. I wanted them to forever remember the experience of building relationships, face-to-face, without their devices. I hoped that their lives would be as sweetened by my part in their wagon train adventure as mine was by theirs. I can’t believe how much I miss them. This is my tenth and final blog about my 2017 4H Wagon Train adventure. I plan to add one more post in a few weeks to share some of my photos of the trip. I enjoyed this writing project as an opportunity to share all that I’ve learned about the history of the past and present wagon train, and about my personal journey. Many people who read this blog in the past 5 months since it began shared their experiences and enthusiasm for the 4H Wagon Train. I was incredibly inspired by these responses. I hope to get back to this blog in January 2018 when I’m gearing up for the 2018 4H Wagon Train and, in the meantime, I welcome your comments and I hope you will share your thoughts related to #4HWagonTrain. I have to make a deal with myself to wear a seatbelt in a car, but I always wear a helmet when I ride or drive horses. I’m from the east coast, I grew up riding English where helmets are part of the outfit and it’s as automatic as underwear. My helmet has saved my skull more times than I can count. I don’t wear a helmet because I am fearful, I wear it because I am fearless. I think wearing a helmet is cool. I have no idea why anyone would scoff at wearing a helmet, but I don’t judge others and I don’t preach about it. Apparently, not wearing a helmet is a west coast thing and when you turn 18 you are magically invincible and no longer “required” to wear one. But, I don’t preach. Kids under 18 years old on the wagon train are required to wear a helmet to ride in the wagon or ride a horse, and helmets are provided. I’ve collected a few helmets over the years, and I have a few in different sizes so I can always offer one to a guest who is riding or driving with me. None of my hard hats are fashionable or expensive, I was never trying to make a statement and I was not one of those girls who cared about how my hair looked. Still don’t care. If my hair looks like I was wearing a helmet, well, that’s because I was wearing a helmet and doin’ fun stuff and how cool is that? I don’t need a new helmet, but I used wagon train as an excuse to buy one. Not an expensive one, but, even less expensive helmets have come such a long way in comfort and features since I was a kid (when plastic was first invented). My new helmet is lightweight, perfectly padded, has a one-handed clasp and easy adjustability – oh Baby! I love my new helmet! I want to sleep in it! It makes me want to do more fun stuff and I feel totally cool wearing it! So, I confess: I wear a helmet and I love it. I confess: I like sleep. I’ve worried about not sleeping on wagon train, so that’s another thing I asked a lot of questions about. Sleep is critical to how you will feel all day long. Will you be exhausted and grumpy, or refreshed and ready for adventure? I wanted to be refreshed and ready! “Components are sleeping mat, wool blanket, 0 degree or better sleeping bag, pillow, bivy sack, large laundry bag. Put wool blanket in bottom of bivy sack, sleeping bag on top of it, roll and put in laundry bag. I’ve asked a few people about what the weather might on this adventure. Here’s how I summarize all of the answers: roll a pair of dice. Whatever two numbers come up on the dice could be the high and low temperatures for the day. For example if you roll a one and a six, the low will be 16 and the high will be 61. OK, well that’s a slight exaggeration, but it would be a mistake not to be prepared for anything. What I’m taking is wool and flannel as an option for sleeping, a warm coat for cool mornings, and T-shirts for hot afternoons, a knit hat and gloves for cold, a brimmed hat for sun/rain protection and a raincoat, obviously, for the inevitable rain shower. I confess I might be over-packing (and over-thinking) but I’m also bringing my longjohns and I’m not rolling the dice on being comfortable. Being warm enough is important to sleep, so you can put an extra flannel sheet inside your sleeping bag to add another layer and bring a knit hat to help keep the heat in. If you use a cot, make sure to have equal layers underneath as well as on top of you to keep warm. A foam/inflating pad can also help w/ comfort and warmth. Bedding and other gear can get dirty with loading and unloading so having a garbage bag or canvas bag helps to keep out the dust and dirt. Who likes a dirty pillow? Not me! I like Leslie’s plan for rolling up your bedding so you just unroll one piece/unit and you’re done! I keep my pj’s in the sleeping bag so I don’t have to dig for them in my stuff. I like tie my bedding items together with baling twine; it’s easier hold and carry, load and unload. Marking your bags uniquely to help distinguish it from the other black canvas bag that someone else packed and brought. Think luggage pickup at the airport. A hat is mandatory for sun protection and you’ll also need sunscreen – a sunburn is not only painful, it could ruin your trip and it will make it hard to sleep! Bring swimsuit/towel/water shoes – there will be water around and you need the water shoes/old pair of tennis shoes on for safety!!! Leave one set of clothes in your car that you will wear home on Friday. This way you don’t pack it around, it doesn’t collect dust along the way and it makes it easier to make stops in civilization on your way home and you won’t smell and look like you just stepped out of the woods without a real shower for a week. A day pack, like a back back, is a good way to pack your snacks and other things you want on the trail. You’ll need a water bottle – you can put it in your day pack or put it on a string/strap to hang it and keep both hands free. Bring the snacks you like to give you some energy on the trail. Peanuts, trail mix, M&M’s can take care of the chocolate craving and they don’t melt like other things because they have the coating….just don’t squish them. There is no shortage of snacks and food, so if you need something, let us know. Pack LIGHT! You will only need a few days worth of pants/shirts and then you can do washing/laundry on layover day. Staying clean and fresh is a challenge, so bring Babywipes for freshening up. You can also bring a solar shower. Bring a flashlight for those late night trips to the biffy, and a few extra batteries. If you are bringing a knife – which can be helpful – make sure it is SHARP; dull knives are dangerous. Have a lightweight raincoat just in case. Pen or pencil for journaling. Pack your curiosity and a sense of adventure! Bring Pioneer clothing if you have some OR at least have the spirit to wear some for “family pictures.” Start thinking of skits, hidden talents you have to share with the group as we have a “variety show” one evening. This Trip Is Going to Be Amazing! It has been awhile since I sat down to write an entry for the 4H Wagon Train Adventure Blog. My time and attention focused on conditioning horses (and starting my garden) as soon as we started having semi-reliable sunshine, and I’ve been making lists and preparations for the trip. I’m obsessive about list-making and plan-making and being ready has been on my mind, non-stop, for months. I’ve been making lists and plans in my sleep! My obsessive preparations were put to a mini-test for the “4H Wagon Train Tune Up” last weekend at Flying M Ranch in Yamhill, Oregon. This is a weekend designed to introduce the participants to the logistics and traditions of life on the 4H Wagon Train, test our gear, and enjoy a small taste of the food and activities and friend-making we can look forward to on the 7-day Barlow Road trip July 8-14. All the details I’d been churning in my head finally got to come out and play – in sports this would be like running plays in your head and practicing some of your moves before you finally get to take the field and see what your team can do. Lemme tell ya, Oh Boy, my team CAN DO! In this case, my team is Johnny and June, full-sibling Percheron crosses. I’ve had them since they were 2 & 3 years old and they are now 8 & 9. We’ve done a lot together in that time and I am always looking for new opportunities and adventures, which is how I got hitched up to the wagon train (pun intended). My team has proven themselves to be able to go-anywhere-do-anything and they do it all with a gusto for the work and affection for the people around them. In all of my little-girl dreams of the horses I would have when I grew up, I could not have dreamed-up these two horses. I am constantly in awe of them, not for their beauty (yeah, I guess they are kinda pretty), but for their work-ethic and what they put into everything they are asked to do. Saturday was only their second time hitched to the wagon and really only my first time driving it! There were a few hiccups and one near-tragic moment that was the driver’s fault (that’s me). But in spite of the driver’s learning curve and the rain and sloppy trails, and wet, low-hanging limbs crashing into the wagon (and them, and me), and some seriously crazy new terrain (like water-crossing stream bottoms with basketball sized boulders), they hardly seemed to notice they were pulling a 2,000lb wood box, rolling on primitive wheels with zero suspension and a big flapping canvas behind them, draped 10-feet over their heads. The first 30 minutes were a bit of a shock from the deafening clatter of the wagon and the rough ride. I was wondering what I’d gotten myself into (and asking myself how I was going to get out of it). My body was jolted and bounced, like I was riding a jack-hammer. Then, we stopped for a break and I focused my attention on the horses, wondering, if they could, would they ask the same question – what are we doing out here? My answer came back to me through their body language – relaxed, ears forward, eyes soft, heads-up, scanning the trail ahead and ready to move out. No stress, no resistance, just quiet anticipation and willingness. During each break, while fallen brush and trees were being cleared by the trail Scout and his helpers, and then, turn by turn, over the next 5 miles or so, over trail you would never imagine you would take in this rig, the answer came to me: this trip is going to be amazing! This is a dream team for this adventure and they are totally into it. Yes, it’ll be rough, but, it’ll be so worth it. When we have conquered 80 miles together in this procession, we will all be changed forever for the better. On Sunday morning, after a fabulous breakfast (something I will definitely be looking forward to on the trip), the wagon train covered another 5 miles or so. The sun shined, and the trail presented beautiful vistas to us around every corner, and the rhythm of wagon and the hoofbeats and the happy voices of kids just filled me up. Ultimately, I was prepared for everything except the range of emotions I experienced in my first 10 miles with the wagon train…and, at the end of the The Tune Up weekend, all doubts about the trip and our readiness and commitment to this adventure had vanished. Two weeks ago this blog was about getting yourself in shape for the wagon train adventure. If you are planning to participate in the 4-H Wagon Train, I know you’ve been getting active and putting some miles on those hiking boots! Hopefully you’ve been keeping track of your miles for the 200-Mile Challenge, too. On my own hikes I’ve been making a plan – if I want my horses to be in the best condition possible for the wagon train adventure I need a plan for their fitness too, and a timeline and some resolve… because when I get home from work every evening, I’m too tired to think about it. I just gotta go do it! If your horse(s) will be participating in the wagon train, you may want to create a similar outline with your own plan of action. There are only 9 weeks until the Tune Up Trek, and only 13 weeks until we hit the trail for the big “Barlow or Bust” Trek! Start every exercise session with warm up time and end with cool down time, increase/ decrease circulation gradually. Depending on your horses current condition, you’ll need to add duration and difficulty gradually, building up to longer rides/ drives and adding hills and trails – doing too much too soon may lead to injury, but not doing enough will not lead to an increase in fitness level. Mix it up – mentally and physically you and your horse will benefit from “cross training” in different activities rather than doing the same thing every session. 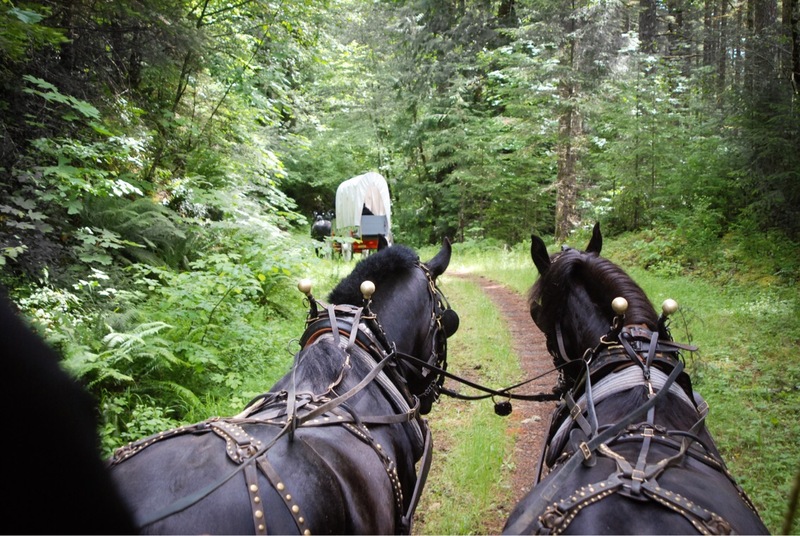 While every horse is different, horses need to be worked more than a couple of times a week over a period of many weeks to get in shape for wagon train – make time for it, all of you preparations will make for a better trip. Work with your horse with not only physical fitness in mind, but also the mental-work of wagon train – walking quietly on a lead rope, riding with other horses and accepting slower paces on the trail, eating and drinking in unfamiliar surrroundings (with unfamiliar water! ), high-lining, etc. Look now at what needs to be scheduled over the coming weeks to make sure your horse is healthy from head to hoof – call the vet for a basic musculoskeletal exam, get teeth checked, think ahead for vaccinations, worming, shoeing or boots, etc. Take a good look at the equipment you’ll be using and how it fits, then monitor how it fits as your horse gets into better condition. Also, it has been said many times but it’s worth repeating, if you are getting new equipment, get it now and use/test it long before the wagon train! Review your feeding plans and whether your horse is getting the right amount and type of feed for the work you are doing. Monitor your horses body condition and be on the lookout for soreness and/or swelling. If you have other advice about how to get a horse into the best condition possible for the wagon train, or other wisdom you’d like to share related to equine health and safety on the wagon train, please share in the comments of this blog. May the sun shine on all of your exercise sessions! This week, the 4H Wagon Train adventure blog was supposed to be about conditioning horses for the wagon train. However, the sun shined in the Willamette Valley a few times in the past week, the waters receded, and this blogger elected to go out and play in the mud with her horses instead of blogging. The good news is that playing in the mud (a/k/a “plowing”) is a great way to condition horses. 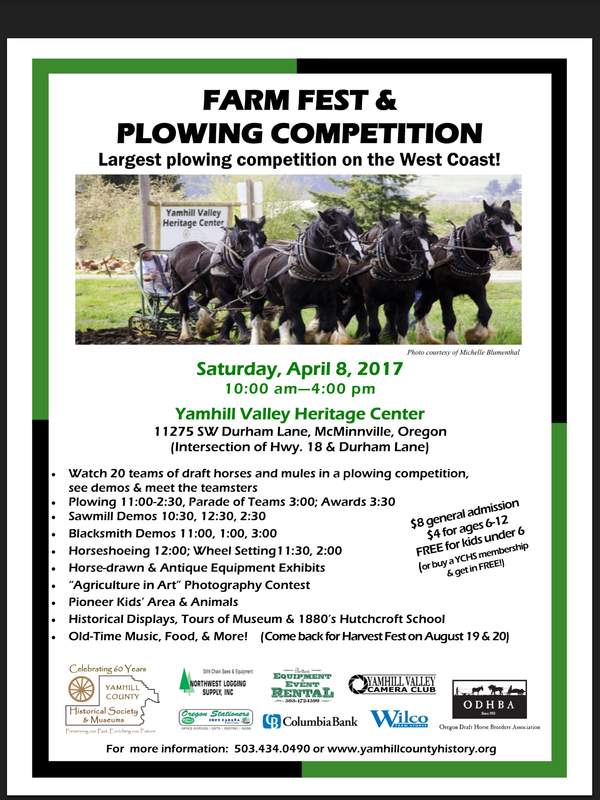 This blogger will be participating in her 4th year of the Oregon Draft Horse Breeders Association Annual Plowing Competition on Saturday. If you want to see wagon train horses and mules in action, I invite you to come out to this event, rain or shine! If you are interested in the 4H Wagon Train, talk to any Teamster at this event – they absolutely will make time to talk to you. There will also be a 4H Wagon Train booth amongst the exhibitors at the event – those volunteers are giving their time to talk about wagon train, so go see them too. Please share this post and invite your friends. More than 30 years ago the 4H Wagon Train idea was brought to life by Teamsters who had been plowing in this same competition for more than 20 years before that. They were plowing their own fields and wanted to find and make ways to work their draft animals for the betterment of their hobby, their industry and their community. Plowing and 4H Wagon Train are inseparable concepts, and, folks, this week it’s time to plow! The first of three 4-H Wagon Train general meetings was held March 18, 2017. The main themes for the meeting were a little bit of getting to know each other and a lot of inspiring us to start getting ready for wagon train. Yes, the overnight Tune-Up Trek & Campout is not until June 10th, and the full 4-H Wagon Train “Barlow or Bust” trip is not until July 7th, but clearly now is the time to start getting in shape and planning for what you will need to make your wagon train experience a great one. For advice on how to get your body ready for your adventure, I consulted Leslie McLeod, “The 4-H Wagon Train Fitness Expert” (an unofficial title), for insight and assistance. Leslie has held many official and unofficial volunteer titles with 4-H Wagon Train over the years. This year she is part of the Scouting Committee, meticulously planning the route, obtaining permits and riding/walking ahead of the wagon train to make sure the trail is clear and dropping markers for the train to follow. She is also an avid runner and off-road biker, swimmer, and, did I say, a meticulous planner? Q: How long have you been participating in the 4-H Wagon Train and what volunteer jobs have you held? Q: What’s the best part of 4-H Wagon Train for you? A: “One of the things that I look forward to most besides the trip is getting prepared. It not only is getting you prepared but building excitement and belonging. I like to look at it as the big goal is accomplishing the trek but there are all kinds of little goals (meetings, a piece of gear, a physical achievement, a bit of knowledge, a work party) that are fun steps to look forward to and accomplish. I think it is wise to encourage people to break this up into manageable chunks and identify critical components to really show them the “doability” early on and to also help them fit little pieces into our everyday busy lives. Q: What is you best advice for getting ready for the 4-H wagon train adventure? A: Condition! Acclimate! Practice! Desensitize! – This goes for horses and people! I think these go hand in hand and starting early and establishing a routine is critical. Walk in the shoes you plan to bring, use the saddle and pad you are going to bring, try to take at least one hike and trail ride at a slightly higher elevation than you are used to or in conditions such as sand or plowing to accentuate the workload the higher elevation is going stress. I usually plan 1 or 2 hikes to Saddle Mt. for the walkers. Use the fanny pack, back pack, or saddle bags you are going to carry. Practice with your gear – like putting up highline, and then letting horses who are not used to it spend time figuring it out at home or in low stress environments. If you are a returning participant, this is just as important – pull all your gear out and make sure it’s functional and ready. Being preconditioned/acclimated/desensitized, whether equine or human, will make for a more enjoyable trip. The trip is challenging mentally and physically and things do happen. It is much better to meet these challenges in comfortable shoes without blisters or with a team that can push that extra little bit into camp after a hard pull without sacrificing their health. I like to say that yes it’s a working wagon train with both pre-engineered and unexpected stressors – but if you have prepared yourself and your horse(s) you make it an enjoyable and fulfilling achievement versus a struggle. Q: If I’m not a person who camps out a lot, what should I expect? A: This is a great first time camping experience because everyone takes care of each other – you’ll have a lot of help. Personally, my biggest struggle is usually my first night and getting very little sleep. You have to acclimate yourself – sleep outside or on the porch a few nights in your bedroll. The natural white noise is actually a great sleep aid for me now, but I still have to get used to it every year. By the way, there is a flyer on the 4-H Wagon Train web site called “What to Expect” – I wrote it, and I recommend it! Q: You’ve provided a readiness challenge for the 4-H Wagon Train participants this year? A: Yes, it’s the “200-Mile Challenge” – you log your training miles/activities from now until the end of the wagon train route and if you achieve 200 miles you get a custom handmade medal. It’s really just about moving your body and any movement counts. You can find the flyer about the challenge at 4HWagonTrain.org. I find that keeping track of your activity and seeing others participating is encouraging. The 200-Mile Challenge is just that, giving purpose to your movement and finding value in your movement – every little bit counts. Q: Okay, the big question! Boots or sneakers? A: This is a tough answer as it can be individual and really should be something that is broke in and what you are accustomed to wearing walking over uneven terrain for as much as 14 miles. If you have poor ankle stability then I suggest wearing a taller boot or shoe. Traditional hiking boots have been suggested in the past but they can be heavy and expensive. If you opt for a lighter shoe be aware that the uneven terrain causes more foot fatigue as the unevenness of the ground pushes through the soft sole material and cause your foot to move around in your shoe more. There are also ways to lace your shoes to help alleviate minor fit problems or issues that crop up on the trail. What works for me is a broke in trail shoe with stiff insoles. I would stay away from, “keds” type, basketball, fashion sneakers, and open toe shoes. Riders and Teamsters should also wear a shoe/boot that is recommended for their activity but also one that can be walked in comfortably as there are instances where they may find themselves on foot temporarily. The second part of the equation for foot care is socks. Splurge on your socks and wear mid weight merino wool socks meant for hiking. Cotton and synthetic socks are terrible for your feet and are usually the cause of blisters and hots spots, so are too thick and too thin of socks. Change them every day at least and use foot powder. Q: What do I wear on the trail, and do I have to dress like a pioneer? A: On the trail I dress in shorts or convertible pants as a walker or jeans as a rider/swamper/teamster. A loose fitting tee shirt with a long sleeve button up light shirt that can easily be tied at my waist. I wear a head covering with sunglasses and have my daypack or saddlebags with water bottle and suggested contents from the different pack lists whether you are a rider or walker. This attire may change with predicted weather conditions so I plan for and pack other layers of clothing for wet and/or cold conditions in my main duffle bag to pull out and take with me for that day. Most of the time the dress requirements are based upon hot sunny conditions. It is imperative to wear or have with you clothing that covers your arms, legs and face in addition to sunscreen. You do not have to dress like a pioneer on the trail but you can. Pioneer attire is available to dress up in on layover day. Also, there is a Dress Code for 4-H wagon Train that you may want to be familiar with (yes, it’s on the web site) as well as refer to the “What to Pack” list for more details. Q: What other gear do you consider critical? There are a few necessary items that are somewhat unique to wagon train – Highline Equipment, a Bedroll and a Mess Kit should be emphasized from the list of things to pack. There is also a flyer about Highlining on the web site. I’m in the process of putting together information about building your bedroll and making your mess kit, so stay tuned. Q: Okay, here it is: The Big What Else? Q: Is it true that you are training a pack goat to come along on the 4-H Wagon Train? A: “Dottie, my rescue goat, probably won’t come on the big trek this year. I still need to discuss with teamsters and riders as they can be very disruptive to horses and mules, which is why we do not allow dogs. She might make an appearance at the Tune-Up Trek & Campout on June 10th. She was a rescue and her body condition and feet need a lot of TLC. Right now she is happily carrying an empty pack around, leads, ties, and snuggles her humans and a horse. Yes, it would be a first, but we’ve had a sort of mascot before and the kids really loved it. Kids who were not used to big draft animals got to start with Festus, a pony-sized pack mule. It helped teach responsibility and it was always a daily honor for one kid to be Festus’ keeper for the day. We’ve had chickens before and there was talk of a pig at one point. Q: What would you say to people that still have concerns about the physical requirements? A: This is a working wagon train and there is physical exertion but it is very moderate and spread out over extended periods of time with many pauses. The main reason behind the 200-Mile Challenge is to encourage people to be moving early on so that they can better enjoy the Trek itself and reduce the risk of injury. You can make significant changes to your health in a short amount of time even with a busy life. The 200-Mile Challenge is the motivation to do such. You all have 4 months to work towards making this your best year and your best Trek. 4-H Wagon Train has been a catalyst in my life, a program that has provided challenges, guidance, a family, and a place for me to grow even as an adult. This is a springboard to healthier living, make every day count and do a little bit every day. Draw a line on a piece of paper to represent the course of your life. For most of us, that line is not straight at all. There are curves and turns happening at the events in our lives, and decisions to do or not to do something, which alter the trajectory. Whether forced or intentional, change is constant. The only thing we know for sure is that you just never know where the next segment of your line may be going. Now add dots along the line to represent the people in your life. New people usually arrive as part of those curves and turns. Going to school, getting a job, expanding your family, making friends, perhaps even going on a wagon train adventure – every dot resulted from a change in your life or caused it to change. Whether you are a fatalist, or you believe everything is an accident, or you believe there is a God with a plan, your line and the dots that connect you to it are what makes you, you. Your formative experiences and relationships are what shape you, and the things that make your line different from every other are tragedy and opportunity. Since tragedy, by nature, is unexpected and mostly unavoidable, the only thing we control is opportunity – something you have to be open to, or seek out. Becky Jarnagin was seeking an opportunity for a vacation with her two pre-teen boys, Chris and Cory (13 and 11 years old). They had done some camping and loved being outdoors, but they needed an adventure. Then one day in 1982 Becky saw an advertisement in the Hillsboro newspaper for the very first 4-H Wagon Train. It sounded like just the thing she and her boys should be doing. Chris wasn’t excited about the trip for the first couple of days on the trail, but Cory was immediately fascinated with the draft teams and started working with a Teamster, Ike Bay, learning how to care for the horses. Chris didn’t want to be left out, so he picked another Teamster, Morris Everude, and started working with Morris and his team. Ike and Morris told the boys, as long as they were willing to do the work and wanted to learn there would be an opportunity for them. So, they both worked hard – fed and watered the horses, shoveled poop, brushed and helped hitch the team to the wagon, and got their first driving lessons. Becky watched the boys apply themselves to their assigned duties as helpers to the horsemen. They carried equipment and bales of hay, learned about harness and horse behavior, and earned their place with the Teamsters on the wagons as “Swampers.” Becky fought the urge to protect them, seeing them leading horses into streams to be watered, being lifted off their little feet by gentle giants, and becoming giants themselves. Instead of worrying about Chris and Cory, Becky became the Head of Family for the family assigned to Ike Bay’s wagon including her youngest son, Cory. She kept things organized inside the wagon and on-schedule outside the wagon. Her other duty was “Brakeman” – Ike had no brake on his wagon, so it was Becky’s job to jam a log under the wheel when they stopped. All of this suited Becky – a “working vacation” and a break from everyday life. Little did Becky and her sons know how much that first trip would alter their lives. Neither Chris nor Cory had any experience with horses prior to that, but they spent years on the trail with the 4-H Wagon Train after that first trip with and without their mom along. They joined their Teamster-mentors at the Washington County Fair every year as part of the crew who helped with all of the Draft Horse events and took every chance they could get to spend time working with horses beyond the wagon train. Even after both boys served in the armed forces in the 90’s, they returned to the trail with the 4-H Wagon Train when they could. Cory got a riding horse that he rode with the wagon train riders. And, at some point, many years after his first wagon train, there came a time when Cory wanted to sell that riding horse. And a young lady came along to buy the horse, who later became Cory’s wife. Are you starting to see the lines and dots? As for Chris, well… on the second year of the 4-H Wagon Train there was this girl named Rhonda who was the helper for her grandpa, a Teamster named Charlie Jensen. Chris thought she was a snob and Rhonda thought he was stuck-on-himself, and they really didn’t like each other at all. Rhonda and Grandpa-Charlie had a rough line just to get to their first 4-H Wagon Train. Rhonda’s dad proposed the adventure to Charlie who did his farming with his beloved dappled grey Percherons. The family started making preparations for their first trip with 4-H Wagon Train, but Rhonda’s dad died before the trip happened. Charlie decided they were still going and built his own wagon for the occasion. Rhonda, a passionate 4-H event rider who grew up sitting on top of one of the plow horses as her grandpa plowed his fields, would not be left behind. If Grandpa and his team were still going on the trip, she needed to be there. Rhonda loved that first trip, but she was shy and kept to herself and stayed close to Charlie and their team and the wagon. The next year, Rhonda rode her own horse with the wagon train riders. Grandpa-Charlie drove his wagon. 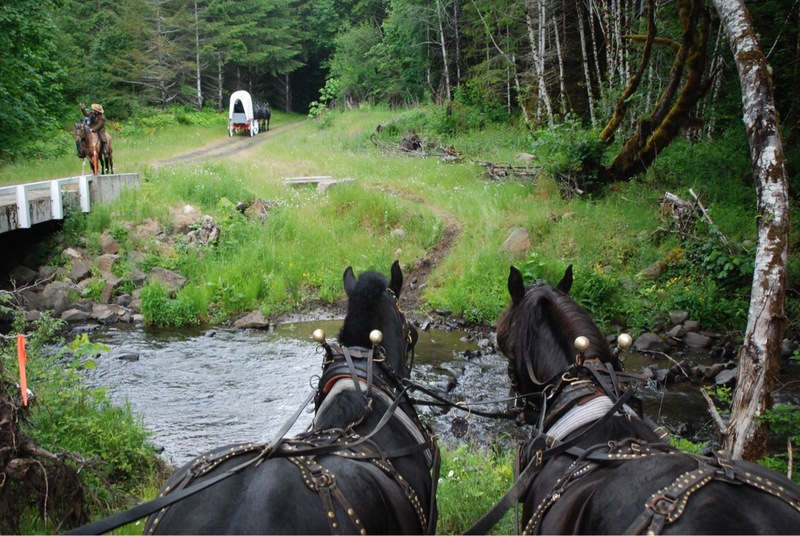 Chris and Cory were back with their Teamsters, Morris and Ike, for their third 4-H Wagon Train. Then, I bet you guessed it, something was different – Rhonda and Chris kinda liked each other. have been married 26 years and have 2 teenagers of their own, and Becky still participates in the 4-H Wagon Train as helper-extraordinaire (all-purpose support volunteer). Becky says the first years of the 4-H Wagon Train were the best experiences, and the toughest, shaping the course of the lives of her and her sons. Becky continues to volunteer with the 4-H Wagon Train because every year is a new adventure with new and returning participants, and kids like Cory, Chris and Rhonda, discover themselves somewhere along the trail. The unique experience of the wagon train opens pathways of connectivity and opportunity for all who seek it out. First sentence of a letter from Lyle Spiesschaert, Washington County Extension Agent, to Acting Assistant Director, Duane Johnson, Oregon State University. If anyone ever needs to know how the idea of the 4-H Wagon Train was conceived, there it is. Lyle doesn’t like to take credit – he is fond of saying that if you want something to get done, you have to give it away. In this case, once the idea was proposed, Lyle gave it away to a trio of Teamsters. But we know from that letter that Lyle certainly proposed the 4-H Wagon Train and modeled it after other similar youth programs he researched in other states. Then, in spite of the doubts and concerns of the academic machine behind the 4-H program, the first 4-H Wagon Train left from Hillsboro, Oregon on July 10, 1982 with 125 people and 78 horses. Lyle says the time was right for there to be a wagon train because the tri-county 4-H was in need of an event that fostered cooperation rather than competition, was family oriented and would appeal to both girls and boys, and engendered an appreciation for the beauty of Oregon’s outdoors. The time was also right for the draft horse community, as Teamsters were still farming with horses and those with the base of knowledge needed for the wagon train were ready for a new challenge. The three Teamsters who spearheaded the effort and laid the lasting foundation for Lyle’s dream project were Lyle’s dad, George Spiesschaert, Morris Everude and George Horner. They were the ones who designed and built the first 4-H Wagon Train event, along with input and hard work from many other people who were involved in the first and stayed involved to build the program for many years thereafter. They figured out what it would take to outfit and supply the group, including wagons and horses and food and water for people and animals. They planned the route and led the group down the trail. They studied and calculated and made lists and collaborated and organized. Their families, particularly the Teamsters wives who hosted frequent meetings, were also a major part of the effort. The first 4-H Wagon Train, according to Lyle, was not much fun. The miles and days were long and the nights were cold. But the adversity of that first year is what brought people together and seems to be the glue that still sticks the group together today. And of course, every year the planning got better and the stories of the volunteers who support the 4-H Wagon Train today will amaze you – coming in future posts on this blog. George Spiesschaert died rather suddenly of pancreatic cancer 20 days after completing his third year of the 4-H Wagon Train. Morris Everude and George Horner carried on the tradition for more than two decades after that. I had the pleasure of speaking to a few young ladies who were the 3rd generation of Everudes to grow up participating in the wagon train and hopefully someday there will be a 4th generation of Everudes involved in the program. The tradition continues – in my case, with the very same wagon George Horner drove for all those years and all those miles. The more I learn about the 4-H Wagon Train, the more I am committed to helping keep this unique tradition alive in our community.